One of my favorite things to do in the summer is take the kids to the beach. I'm not sure why, because we have to pack a metric ton of stuff, the inside of the van ends up looking like a sandbar, it takes an hour to bathe everyone once we get home, and I still find sand in crevices I didn't even know the baby had at diaper changes! But we still go, often. Here are some of the things that go through my mind when we spend a day at the beach... how about you? Awww, the baby's so cute playing in the water — no, he's not playing, he's DRINKING it! Stop! Stop! If they let that pool noodle float away again, I am definitely not buying them another one. No way. Is this even real life? I asked ten times before we left the house if anyone had to go to the bathroom. Look at that other mom's beach bag. *Drool. * It's huge. Would it be weird to ask where she got it? And she has a rolling cart! I want that. I need that. Wait, am I listening to myself? I am so uncool! What happened to me? Oops, guess I should have put the sunscreen on the kids before they all jumped in the water. Hmmm... does that other family look upset that my son is playing with all their sand toys and staked out a spot under their umbrella? No? Well then, I see no problems here. Who got sand in the water bottle?! Are they screaming because they're having fun, or...? Nope, that is definitely unhappy screaming. We have one rule: only splash people who want to be splashed. Was I not clear enough on that when I repeated it seven times on the way here, put it to music and a choreographed dance, and had the kids chant it in unison after me? I really don't want to get in that frigid water, but she's asked me three times now... good thing I brought distractions. I mean, snacks. I brought snacks. I thought I told you not to put your towel in the water. No, you cannot have mine. I'm about five minutes from done with adjusting goggles, finding sunken goggles, and detangling goggles from hair for today. What are these crab- and starfish-shaped pieces of plastic, anyway? What child in the history of children has ever played with these things? And why do I keep bringing them here? Please do not announce that you are peeing in the water, please do not announce that you are peeing in the water, please do not announce — crap. Oh yeah, like your kid never pees in the water, lady. Enough with the stink-eye already. I don't like the way those seagulls are eyeing our bag of Goldfish. I'm not afraid of birds but... I'm sort of afraid of them now. We probably should've labeled our toys before coming here. It's time to go and I have no idea how to tell our crap from everybody else's crap. P.S. If you're at the beach and a small child approaches you saying they have to go to the bathroom, always seek confirmation on whether it's #1 or #2 before whispering, "Just go over there and quietly do it in the water." Don't ask how I know. I love this Jen! The baby drinking/playing in the water could be my child--all the way! 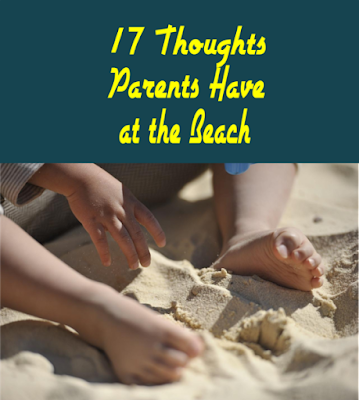 I definitely have some of these same thoughts when going to the beach with my daughter, along with "Yes, that's sand. No it's not to eat..." *as little hands grabs a handful and puts most of it in her mouth..." Ah the glamorous life of parenting, right? There's a subtle difference between taking your baby to the beach and taking them to an all-you-can-eat buffet. And babies don't understand subtlety. Jenny, you are so hilarious! Real life! Thanks for the laughs! Choreagraphed dance! my side is almost splitting!